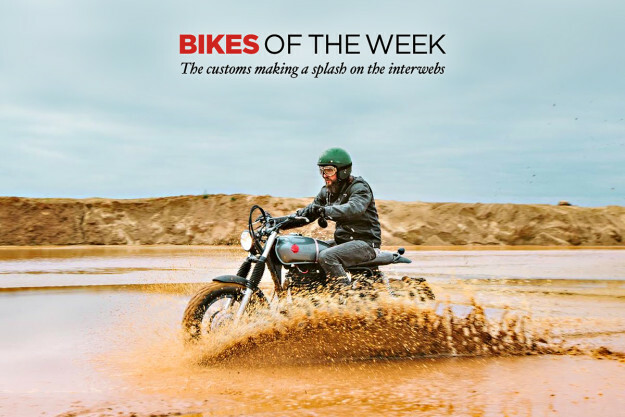 Suzukis from Russia and Italy, Norton Commandos from England and the USA, and a French BMW: there’s a distinct multinational air to this week’s selection. Matt Neundorf provides the translation. 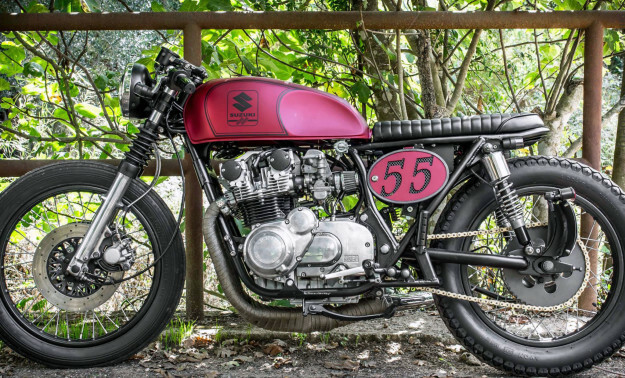 Suzuki ST400 Tempter by 53 Fast Living This one’s apparently inspired by the aircraft piloted by Japan’s flying aces in WWII. The Moscow-based builders from 53 Fast Living have created one of the most fun looking scramblers we’ve seen to date. With only 27 horses on tap from its single-cylinder mill and a decision to maintain the stock drum brake set-up, every ounce of excess was shed to optimize performance and maneuverability. The airbox was eliminated completely. A rear loop was created, topped with a slender, scrambler-style seat. Below is a relocated, minimalist battery box to fire up the most juvenile amusement that can be had on two wheels. I’m especially keen on the manner in which the three-piece rear fender affair was sorted—the visual voids it creates without sacrificing essential protection are simple bliss. Harton by North Leicester Motorcycles Based in the English Midlands, NLM pride themselves on their abilities to rework vintage Italian steel. Their Mediterranean resume is impressive, but it’s this British/American hybrid that’s caught our eye. Working with a Norton frame and donor motor is nothing new; Tritons are almost a brand unto themselves. However, stuffing one of Milwaukee’s finest big-twins into a Birmingham featherbed frame is a touch rare. BMW K100 by Ed Turner The instructions were limited—”make it blue and in a tracker style”—and the budget was even tighter. So Karl Renoult of Ed Turner Motorcycles had his work cut out with this BMW project. 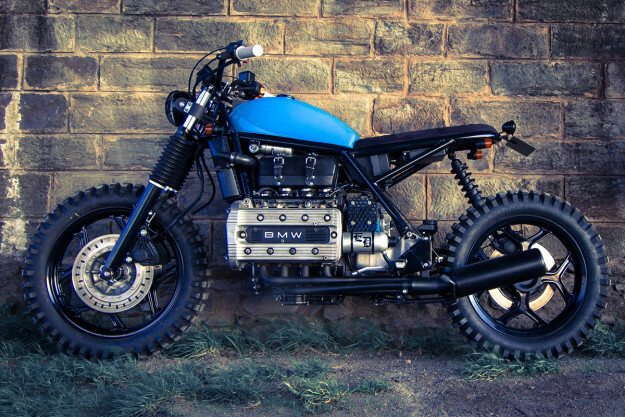 But like any true professional, Ed took up the challenge to create this stunning sky blue K100 tracker. Ed naturally wanted to shed some of the Bavarian’s heft. So the plastics were ditched and a slender new single hoop was welded on. The all-new seat was designed to accentuate the tubular frame’s aesthetic: tucking and rolling the fabric eliminated overhangs. Coupled with the K-Series’ signature rear shock set-up, it creates a look of incredible lightness at the rear. Suzuki GS550 by Brat Box The GS550 is a popular choice for builders looking to create a reliable and stylish cafe racer. This 1979 model from Italy’s oddly named Brat Box Caferacersalento isn’t revolutionary, but it’s certainly well executed. As their name should imply, the “brat” and “cafe” styles are major influences to their design direction. In this case the GS’s rear profile is flattened by the requisite thin and flush saddle, exposing the rear loop—with a subtle kink. The mismatched Avons, with a MKII at the back, hint at ventures down a dusty path—but the Speedmaster up front, directed by clip-ons, tells a different tale. There’s confusion to be sure, but it comes together in a package that just seems to work. And set off by that gorgeous matte red tank. Norton Commando by Vintage Steele The indoor seclusion of an icy winter has fueled a motorcycle build designed to conquer all terrain. 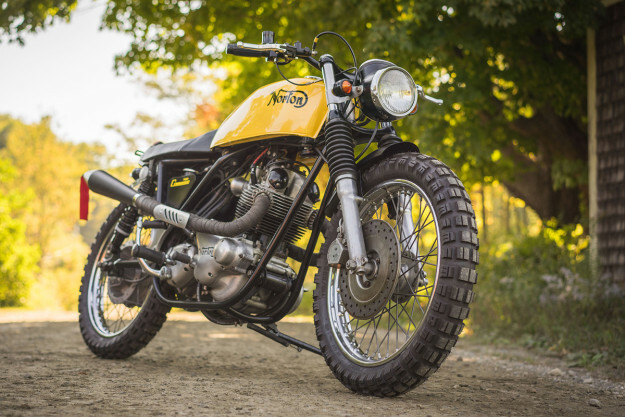 When Vermont’s Vintage Steele stumbled upon a rough Norton Commando with a ‘72 frame and ‘70 motor, they knew it deserved more than the scrapper. Hidden in the warmth of their garage, the crew went to work. 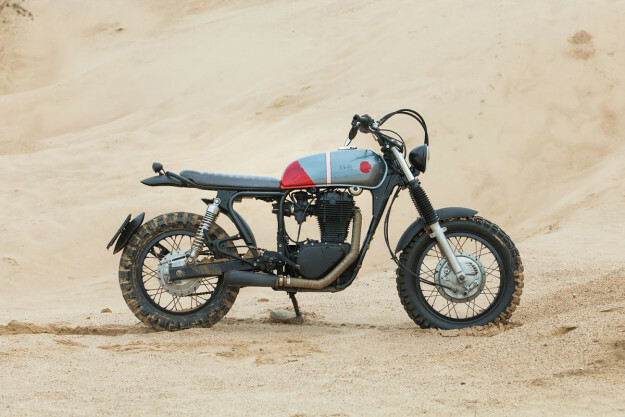 The frame was shortened to create a classic scrambler stance, and the tank was swapped for a CB400 unit. 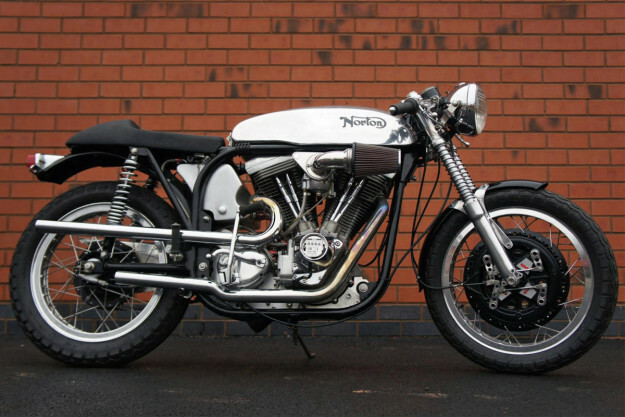 Powder coating and paint were outsourced, but the Norton’s finicky Lucas electrics were patiently re-routed and replaced by in-house. Caleb Matthiesen upholstered the new seat, and a very pretty custom oil tank was fitted. The ubiquitous high-mount exhaust was the final piece to fall into place.